Over the Christmas holidays, I was compelled (a visit was due anyway) to return to sunny South Africa for the first time in five years - my first Christmas back in SA in 7 years - by my cousin's desire to marry a gun-toting children's pastor (lovely chap). As part of my holiday back home, I decided I'd venture out to see what South Africa's first and only (at the moment) parkrun was like. It'd been a very very very long time since I last ran in South Africa, let alone raced, and from the one other run I'd had in Jo'burg during my hols, a gentle 10k, I knew it would be a toughie. So nice and early on Christmas eve, I bundled my wife into the car and we headed down to Delta Park for a quick spin round the park (me - my wife doesn't run). We got there with about half an hour to spare so I could warm up and introduce myself to the organiser - the one and only, Bruce Fordyce. During the intros it came to light there were quite a few of us "foreign" bods there. There was me, another chap from Cambridge (also a Saffer) and 3 Kiwis, all doing our first SA parkrun. It was also a much larger turn out than expected with 24 people, which isn't bad considering up until that point the record had been 31 with absolutely no publicity. ... and set off for what is probably the toughest parkrun you'll encounter. Due to Delta Park's location and the general geography of Johannesburg, hills are unavoidable, and boy is this a hilly run. Thankfully it's only a single-lapper (I prefer single lap runs) scenic run with a good mix of trails, grass and tar. I've only done the Reading and the Delta Park parkruns (note to self: I really must aim to do other parkruns this year) and I definitely prefer the Delta Park run. A combination of the altitude, hills and varied terrain saw me finish in 7th place in a rather slow time of 21:43. You'd be amazed how much of an impact altitude has on your running performance - it's really hard work running at about 1600m above sea level, especially up hill, after only training at sea level for several years. Perhaps Aristotle was correct or perhaps it's because we South Africans are still bitter about the rugby World Cup but we somehow contrived to welcome our All Black friends by planting a snake (suspected Rinkhals- spitting cobra) in the first 300 metres of open grassland. A few minutes after we had set off Kelly hobbled back with a bite above her ankle. Kelly was rushed off to hospital where she was treated and discharged a couple of hours later. The doctors were not entirely convinced that she had suffered a snake bite-. And we comforted ourselves by remembering that many venomous snakes are extremely reluctant to exhaust their poison in defense prefering to save venom for their prey. In other words they bite often but don't expel poison. The Rinkhals much prefers fat rats, toads and other snakes to skinny Kiwis. You'll never get that kind of excitement and action at a parkrun in the UK. Sadly, I didn't get the chance to run another parkrun whilst in SA, but Bruce plans on putting the marketing engine into full swing this year to get the word out that parkrun has made it to SA and needs runners. 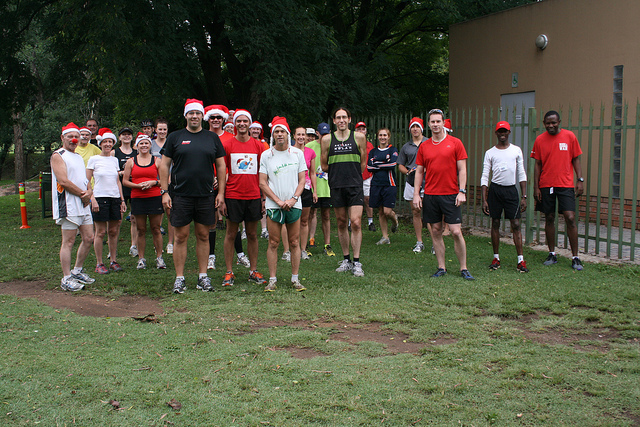 If all goes well, parkruns will be sprouting up all over South Africa in the next few years. I wish them the best of luck and will definitely be bringing my barcode with me when I next visit South Africa.